This Verblio sample post was created by Lorraine A., who is a prolific writer on the Verblio platform. During her content writing career, Lorraine has written an incredible 1,650 SEO-optimized blogs for clients in a variety of industries. In this post, Lorraine showcases her passion sports and outdoor activities. She has written extensively about boating, sailing, fishing, golf, and camping, and has created content for one of Verblio’s leading outdoor sports clients. As you read this 624-word, top-of-funnel sample post about winter fitness and sports, you’ll notice that Lorraine has created a piece that appeals to readers with a variety of talents and interests. With Verblio’s help, you, too, can publish excellent sample posts that highlight your outdoor or fitness brand. Winter is here to stay for a while, and it is time to get outside and try some fun winter sports. You may already be an experienced snowboarder or skier, or you may be ready to try a brand new activity that will take you outdoors during the chilly months. Do it now to experience a new activity and enjoy your winter vacation on a snowboard, snowshoes, or cross-country skis. 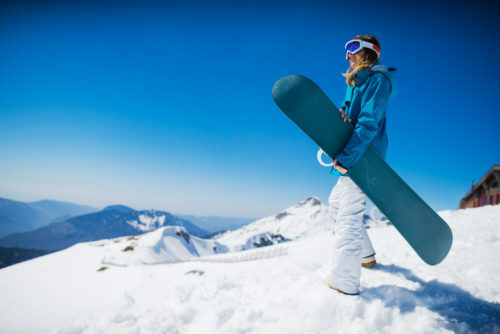 The snowboard was once referred to as a “snurfer” since it was designed for people who enjoyed surfing and skateboarding. This sport started in Michigan in the 1960s and grew into a Winter Olympic sport by 1998. The snowboard combines the skateboard and a small surfboard into a great winter activity that can be practiced anywhere there is a hill. This is a sport where all family members can participate at reasonable prices. Snowboards are controlled in the same way that a skateboard is controlled with pressure from your legs and knees. The boots used for the sport are softer and more flexible than regular ski boots. Extreme skateboarders have performed some of the same powerful moves on snowboards. You don’t have to be a skateboarder to learn how to slide down and up hills on a snowboard. Many ski areas offer lessons and maintain hills exclusively for snowboards. Give it a try if you are looking for something different! The wide snowshoe was originally designed for people to move across the snow with better balance and traction. The larger snowshoe distributes the weight of the walker and prevents boots from sinking into the snow. Modern snowshoes are made of lightweight material such as aluminum. They have evolved from the rawhide lacings on wood frames that were used for centuries by people living in snowy terrain. The origins of the snowshoe may go back thousands of years since they were used across northern Europe, Asia, and North America by indigenous people. The equipment today comes in different sizes and styles for people of all ages. People select snowshoes for comfort and ease of walking. Poles are used for balance while walking. There are snowshoe races and even softball games played in snowshoes for fun. Most people who use snowshoes are winter hikers who want to enjoy the outdoors. This is another family activity that is popular everywhere there is snow. It is a great way to explore the environment on special hiking trails through woodlands. Many ski resorts maintain trails for snowshoes walkers and cross-country skiers. This is a slower, more relaxed style of skiing. The concept of sliding through the snow on skis was apparently developed in Norway centuries ago. Barrel slats were used for skis and sticks for poles. Modern composite materials are used for skis today. This is a wonderful exercise for everyone. This popular sport appeals to people of all ages. Skiers move at their own speed on special groomed trails. Many cross country ski areas have warming huts along the trails for skiers and people on snowshoes. There are even sites for hearty snow campers. The equipment includes special softer shoes and narrow skis with loose bindings. The heel of the shoe does not attach to the ski, unlike Alpine skis. Skiers use poles for balance and pushing forward. All winter sports including sledding offer exercise and the opportunity to communicate with nature. These activities usually take place after a snow storm although some hearty skiers, snowboarders, and snowshoe hikers take to the trails and hills during a light snowfall. Visit our sporting goods store today and check out our winter sports equipment and outerwear. We will find the right equipment for your favorite sport and provide information on lessons and facilities at our nearby resorts. We eat our own dog food. It's true. We use Verblio's service for our own blog. The same writers that write for our clients write many of our blog posts—like this one. Any posts with an author named "Verblio" were written by a writer from our talent pool of 3,000+ U.S.-based writers. We sure couldn't do it without them.